The works on this tour were produced by artists from France, Germany, and the Low Countries between about 1400 and 1550, years when the culture of early modern Europe emerged from the social, political, and religious orientation of the Middle Ages. This period witnessed the development of capitalism, the rise of nation states, and the Protestant Reformation. By 1400 Europe's population, devastated by plague and warfare in the preceding century, began to rebound. Much of the growth came in cities and towns, where a money economy produced an entirely new middle class of bankers, merchants, and skilled artisans who were increasingly well educated and receptive to new ideas. In the universities, philosophical nominalism, which held that the particulars of sensory experience are more "real" than abstract ideals, focused attention on man and the natural world. Soon the boundaries of that world were expanded by exploration. The pace of change was accelerated by the invention of movable type in the mid-1400s. More books were printed in the forty years before 1500 than had been produced during the entire Middle Ages. Other developments revolutionized painting. A new market was created by the middle class for small versions of the painted panels found in church altarpieces for use in private devotions at home. Except for portraits, painting on panel had not previously commanded the same prestige among royal patrons as the more sumptuous arts of tapestry weaving and manuscript illumination. At this time, however, artists reproduced the domestic settings and cherished possessions of a new clientele. They did so with a meticulous eye narrowly focused on detail. And they used a new technique, oil painting. The introduction of oil paints in northern Europe, not invented but perhaps perfected by Robert Campin and Jan van Eyck, allowed artists to build up layer after careful layer of translucent glazes, blending color and reflecting light to mimic appearances in a way not possible with the flat, opaque colors of quick-drying tempera paints. The realistic manner of these early Netherlandish artists soon replaced the artificial delicacy of the so-called International Style, which had dominated late Gothic art all across Europe. The realism of these new paintings increased the viewers' sense that the scenes they witnessed were continuous with their own experience. In religious painting, whether on church altarpieces or private devotional panels, it prompted an empathetic, often emotional response that allowed viewers to share in the suffering of Christ and drew them into the same sphere as the Virgin and saints. These intimate images appealed to the direct and personal religious experience stressed in late medieval piety. In the Low Countries particularly, where this so-called devotio moderna (modern devotion) was centered, laymen and women joined religious confraternities to emulate Jesus in their everyday lives, influenced by such devotional literature as Thomas à Kempis' Imitation of Christ. Portraits were often included in devotional works, in which donors were depicted as witnessing a sacred scene. Independent portraits, however, are extremely rare before about 1425. This painting is the only one of a woman known to exist today. Her identity remains a mystery, but her dress and hauteur suggest she may have been at the French court; evidently she was a person of considerable rank. Portraits were commonly made of prospective partners in arranged marriages between powerful royal families. Van Eyck, for example, painted such portraits while on diplomatic assignment. The age and commanding presence of this woman, however, may indicate that she was already in a strong dynastic position. Her profile pose produces a clear and authoritative image and avoids direct contact with the viewer's gaze. The austere line of the subject's features is emphasized by the high forehead of her fashionable plucked hair line. High contrast against the flat background exaggerates the refinement of her likeness. The artist has painted individual details, such as the crimped curl at the brow and the heavy cage beads pinned at the shoulders, with careful attention; yet they are subordinated in a composition that has geometric, almost abstract severity. These ornamental qualities are typical of the International Style, which predominated all over Europe until it was supplanted by the more naturalistic work of the painters Robert Campin and Jan van Eyck and their followers. This imposing panel, once part of a large altarpiece, is probably the work of a follower of Robert Campin, who along with Jan van Eyck transformed painting in the fifteenth-century Netherlands. Campin's influence can be traced through succeeding generations. Among his many pupils was Rogier van der Weyden. The scene places Mary and Child with saints -- from left to right, Catherine, John the Baptist, Barbara, and Anthony Abbot -- in a walled garden. This enclosure represents both Mary's virginity and the verdant shelter of paradise, which is accessible to worshipers through Christ and the intercession of the saints on their behalf. An unnaturally high horizon makes the ground appear to open up from the viewer, as if to convey him or her into the sacred company. The child is carefully placed at the point where the various triangles -- formed by the Virgin's robe, the gazes of John and Barbara, the lines of Catherine's sword and Anthony's staff -- converge. Each surface is treated with an almost photographic precision. Plants are depicted with botanical accuracy, and the textures of rich cloth, an important source of wealth in the northern cities, are equally detailed. However, these elements do not combine to create a realistic space. The perspective is more intuitive than scientific and the figures are too large for their surroundings, their size matched not to nature but to their symbolic importance. Van Eyck is considered one of the greatest painters of any period. Advances in oil techniques helped him paint the physical world in minute detail and with a degree of realism never before possible. It was said he knew fabrics like a weaver, buildings like an architect, and plants like a botanist. Here it is hard to believe that the angel's gleaming brocade is yellow pigment, not true gold, "woven" with brushstrokes, not threads. In this painting Gabriel announces to Mary that she will bear the son of God. She modestly draws back and responds, "Behold the handmaiden of the Lord." Her words are printed upside down for the Lord above to see. The Holy Spirit descends to her on seven rays of light. This is the moment God's plan for salvation is set in motion. Through Christ's human incarnation the old era of the Law is transformed into a new era of Grace. Almost every element in the painting contributes to this theme. The architecture moves from older, round Romanesque forms to pointed Gothic arches. In the floor tiles, scenes from the Old Testament prefigure New Testament events; David's slaying of Goliath, for example, fore tends Christ's triumph over the devil. The single top window, where Jehovah stands, contrasts the triple windows below, which suggest the Christian trinity. Even Mary's overlarge figure inside the chapel operates symbolically to underscore her identification with the Church. The lilies beside her refer to her purity. Rogier was among the greatest painters of northern Europe. His inventiveness and emotional intensity had great and lasting influence. 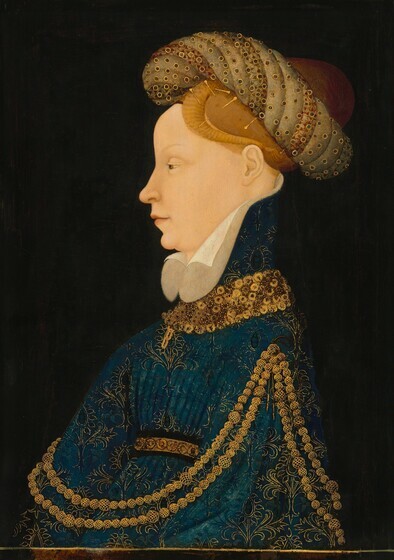 Late in life he was particularly interested in portraiture and accepted many commissions from the Burgundian court, including perhaps this unidentified woman. In the fifty years or so since the Franco-Flemish portrait in this gallery was painted, poses of sitters were rotated from strict profiles to three-quarter views that revealed personalities in a more intimate and directly personal manner. The intense concentration in this woman's downcast gaze is reinforced by her fingers, which seem to press nervously together. The position of her hands, held not in prayer but as if resting on an unseen ledge, suggests that this was an independent portrait and was not meant to accompany a sacred scene, even though it was Rogier who first combined such half-length portraits with devotional images. A severe balance of pattern and form -- notice the interlocking triangles in her veil and neckline -- creates a brittle, abstract elegance that is typical of Rogier's portraits. Details are reduced to geometric clarity, and the face is painted in a restrained, linear manner. Compare its smooth shallow planes to the irregular facial terrain of Diego de Guevara. In that later work, light and shadow combine to reveal every bulge and furrow. Petrus Christus was the leading artist in Bruges after the death of Jan van Eyck. He purchased citizenship there, presumably so he could enter the painters' guild, and became known primarily for devotional images. This portrait and its mate were most likely part of a hinged three-part panel painting called a triptych. These were almost certainly the wings, which when opened showed the man and woman praying to an image of the Virgin and Child in the center. Since they are depicted in a domestic setting, the panels were probably made for private devotion in the couple's home. The woman's costume is that of a wealthy matron from the Low Countries, but the coat of arms depicted is that of the Vivaldi, a prominent Genoese family with extensive banking and commercial interests in the north. Stuck to the wall with dabs of red sealing wax is a woodcut. It depicts Saint Elizabeth of Thuringia, so in all likelihood the woman's name was also Elizabeth or some variant of it. Undoubtedly, she and her husband, known to be a member of the Lomellini family by the coat of arms on his portrait, were part of the large Italian business community in Bruges. These families, because they carried small panels like this one home with them, played an important role in spreading the oil technique and the precise style of northern paintings to Italy. As Michelangelo noted, "In Flanders they paint, before all things, to render exactly and deceptively the outward appearance of things." Dirck Bouts was a member of the second generation of artists who followed and pursued the style of Jan van Eyck and Rogier van der Weyden, but little is known about his life or career. He worked primarily in Louvain, in modern-day Belgium, and was married to a woman wealthy enough to be called "Metten Geld" (with money). This painting is one of only a very few to survive by the artist. It illustrates the noble solemnity of expression and the meticulous technique for which Bouts was known. Small enough to fit in the palm of the hand, this tiny work was evidently an item of personal devotion. The light that falls on the Virgin and Child, their expressions, and their postures are subtly manipulated to make the infant appear bright and alert while the Madonna seems pensive and somber, her face darkened by sadness. Fifteenth-century viewers would have immediately interpreted this difference as evidence that Mary was foreseeing the future of Christ on the cross. They believed that the Virgin had suffered along with her son, actually experiencing the same pain. This kind of empathetic identification was an important element of religious life in the north during the fifteenth century. By meditating on such dramatic closeups of great immediacy, the worshiper also could experience Jesus' life and suffering in a direct and personal way. This two-sided panel was once the right wing of a diptych. On the front we see Veronica, among the most venerated saints of the Middle Ages and Renaissance. Several legends about her were conflated and she was identified with different people, including the compassionate woman who gave Jesus a cloth as he struggled on the way to Calvary; when he wiped his brow with the cloth, it was miraculously imprinted with his face. By the 12th century, a cloth believed to be Veronica's veil had entered the Vatican. Indulgences (reducing time in purgatory and even remitting sin) were granted for reciting prayers either before the relic or before images of it. Veronica was also invoked against the danger of sudden death before confession. On the reverse of the panel, a snake slithers from a chalice, referring to an event in the life of John the Evangelist when he blessed a poison cup and drank from it without harm. The serpent represents the departing poison and points to the promise of salvation in the eucharistic wine. The left panel of the diptych (now in Munich) depicts John the Baptist, with a skull on the reverse. Memling worked primarily for the middle class and the resident Italian community in Bruges. He apparently studied with Rogier van der Weyden, but he did not adopt Rogier's intensely emotional style. His subjects are devout, but placid, his landscapes infused with late summer stillness. By the time of his death, Memling supported a large workshop and was among Bruges' wealthiest citizens. His work was also popular in Italy, where it was admired for its clear colors and delicate vistas. Details of the landscape in this panel, which once belonged to the Venetian humanists Bernardo and Pietro Bembo, may have influenced the young Raphael. This small panel, along with Sittow's Assumption of the Virgin, was made for an elaborate altarpiece in the private chapel of Queen Isabella of Spain. Most of the jewellike panels -- there were more than forty in all -- were painted by this artist, who must have been Netherlandish but moved to Spain to work for the court. Probably they were among his earliest commissions. Later the panels were admired by the great German artist Albrecht Dürer for their unequaled "precision and excellence." Here the three temptations of Christ, described in the Gospels of Matthew and Luke, are illustrated with great narrative delight. In the foreground, the devil, horned and with demon's feet though clad in a monk's robe, tempts the hungry Christ to turn stones into bread. In the distance at left he offers the kingdoms of the world from a mountain top; and on the right, from the pinnacle of the temple in Jerusalem, the devil challenges Christ to hurl himself down without injury. The dramatic encounter is set in a landscape typical, not of the biblical wilderness described in the Gospels, but of a northern town. The soft air fades to blue in the distance, helping the eye to see the recession of space. The composition may have been based on models from manuscript illumination. While in Spain, Juan de Flandes's style became broader and less delicate; though he later painted larger works, he continued to delight in narrative detail.